Born in Winnipeg, McKenzie started his long and stellar hockey-writing career at the age of 17 with the Winnipeg Free Press. After World War II, he was hired by the National Hockey League as its publicity director. 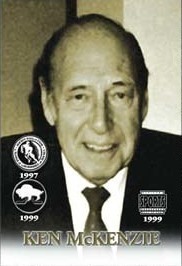 In 1947 McKenzie co-founded The Hockey News with W.V. Cote. his other contributions to the NHL include its Press and Radio Guide, Official Guide and Record Book and Hockey Pictorial. Ken McKenzie was elected to the Hockey Hall of Fame in 1997 and inducted into the Manitoba Sports Hall of Fame in 1999.